I spend a lot of time talking to my clients before and after sessions about things that they can be doing on their own time to help ease pain, tension, and stress. Sometimes these tips include items that can be purchased online for home use. Clients often ask about the pillows/bolsters, oils/lotions, and books that I use in my practice. This page is to provide a list of the things that I use so that clients can purchase them for themselves or their loved ones. I became an affiliate for Amazon and Yoga Download because I use both of these companies regularly. I may receive a small commission from any purchases made using the links on this page. However, these products may be available from other retailers, and I encourage everyone to shop around to find the most reasonable price! The wedge is an excellent bolster for people with reflux, pregnant women, or just reading in bed! This is one of the most popular bolsters I use in my practice! It supports the knees and takes the pressure off the low back. 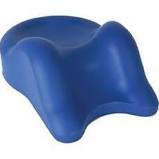 This little guy is great for side sleepers with hip and low back pain. It rests between the knees to align the hips. This side sleeper pillow supports the natural curve of the neck, taking pressure off the shoulder. This cushion supports your lumbar spine whether you sleep on your back or your side. Very effective!